A vivid sunset reflects off the surface of Lake Audy in Riding Mountain National Park situated in the province of Manitoba, Canada. A peaceful scene as the sun brushes the horizon at sunset sending beautiful colours over the surface of Lake Audy in Riding Mountain National Park, Manitoba, Canada. The majority of campsites at the rustic Lake Audy campground in Riding Mountain NP are situated right at the waters edge - a great place to sit and watch a glorious Manitoba sunset at the day's end. Lake Audy is a popular recreational lake for swimming, fishing, and boating, although the prevailing peacefulness of this and other rustic campgrounds in Riding Mountain National Park is what draws visitors to this popular oasis in the prairies of Manitoba. Sunset over a wooden wharf at Lake Audy, Riding Mountain National Park a UNESCO Biosphere Reserve, Manitoba, Canada. 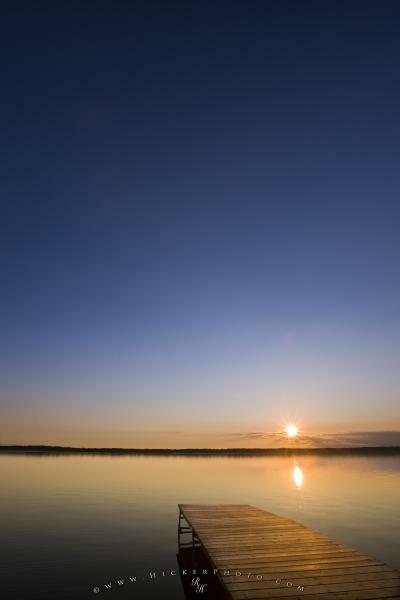 Photo of sunset over Lake Audy, Riding Mountain National Park, Manitoba, Canada.